The Private Practice Section’s (PPS) congressional advocacy in 2017 was primarily focused on playing defense. For the majority of the year, the Republican-controlled House and Senate were focused on a broad health care package that sought to replace or reform many provisions of the Affordable Care Act (ACA), including eroding the requirement that qualified health insurance plans must include 10 essential health benefits (EHBs), one of which is rehabilitative and habilitative care. In January 2017 leaders of Congress decided to use budget reconciliation (allowing for a simple majority instead of a filibuster-proof 60 votes for passage in the Senate, in exchange for a limitation that all provisions in the bill must impact federal spending or taxation) to pursue this goal of health care reform. Throughout the debate PPS, lobbied members of the House and Senate on behalf of physical therapists and their patients. Additionally, the Section sent letters to all senators in June and September advocating for the preservation of EHBs and other consumer protections while criticizing the lack of transparency and standard legislative procedure. PPS members were called upon to communicate their opposition to the erosion of the EHBs and support for consumer protections such as children being able to remain on their parents’ insurance up to age 26, the requirement that insurance companies sell plans to patients regardless of preexisting conditions, and protections ensuring patients cannot lose coverage for a preexisting condition. On May 4, 2017, the House passed their version of health care reform—the American Health Care Act—with a vote of 217–213. All Democrats and 20 Republicans voted no. However, health care reform did not become law. Despite multiple attempts in the Senate, Republicans failed to capitalize on their 52–48 majority and pass a health care reform bill before they ran out of time to use the advantage of the budget reconciliation—which expired when the fiscal year ended on September 31, 2017. Another top priority for 2017 was to achieve the repeal or replacement of the arbitrary per-beneficiary therapy cap on outpatient rehabilitation covered by Medicare. As you know, an exceptions process for the therapy cap has been in effect since January 1, 2006, and has been extended multiple times through legislation. Since 2012, the Centers for Medicare & Medicaid Services (CMS) has applied a manual medical review process to therapy claims when a beneficiary’s annual combined expenses for outpatient physical therapy (PT) and speech-language pathology (SLP) services exceed $3,700. Our advocacy focused on developing and then supporting legislation that would not only repeal the therapy cap but would also minimize paperwork and procedural limitations that could hinder access to necessary care in the future. In June, PPS sent a letter to the Energy and Commerce Committee’s health subcommittee before a July 2017 hearing that argued in favor of repealing and replacing the flawed therapy cap. Last September we, along with other stakeholder members of the Therapy Cap Coalition, met with the staff of the three committees of health care jurisdiction (House Ways and Means Committee, House Energy and Commerce Committee, and Senate Finance Committee) about the importance of addressing the therapy cap with a permanent legislative fix. As a result, when the House Ways and Means Committee released their Medicare Extenders package in November, it included legislative language that would permanently repeal the therapy cap and replace it with a policy that would allow for targeted postpayment medical review for those cases which accrued over $3,000 of spending on PT/SLP services for a single beneficiary; this was the policy that PPS, other stakeholders, and committee staff had agreed on. The next step was to include this legislative fix in a bill that was going to be voted on before the end of the year. In mid-December, only a week before planning to recess for the year, the House released their language for the Continuing Resolution (CR) legislation that would keep the doors of the federal government open. While it had been widely expected that the Medicare Extenders (and the therapy cap repeal policy) would be part of the government funding package, it was not. When we suspected that CMS’s manual medical review process as well as its current authority to provide an exception to the cap on therapy would not be addressed before it expired, PPS and other Therapy Cap Coalition stakeholders sent a letter to congressional leadership requesting swift action to repeal the therapy cap. When legislators left Washington without resolving this important issue, the exceptions mechanism expired on December 31, 2017. Much of early 2018 will be focused on continuing efforts in pursuit of a permanent therapy cap. As Congress was almost singularly focused on large issues such as health care reform and the therapy cap issue, there was little to no room for consideration of niche health care issues such as allowing physical therapists to opt out of Medicare or privately contract with Medicare patients. In late October the Medicare Patient Empowerment Act (HR 4133) was reintroduced in the House and began to gain cosponsors. The bill language remained the same as last Congress and would allow Medicare-enrolled providers (including physical therapists) to contract directly with their patients who are Medicare beneficiaries—on a case-by-case basis. The decision to opt out would not affect the entire practice, only that patient–provider billing relationship. Signed into law on December 22, 2017, the tax reform package was primarily focused on changes to the tax code; however, pieces of health care policy were tucked inside. The law repeals the fines imposed by the ACA on those Americans who don’t carry health insurance. This is often referred to as a “repeal of the individual mandate,” but this law does not actually remove the requirement; instead, beginning in 2019 it merely reduces to zero the fines imposed when one does not have health insurance. The Congressional Budget Office (CBO) warned that without the individual mandate, healthy people may opt out of getting insurance coverage, so that the number of uninsured Americans could increase by 13 million by 2027. Additionally, CBO predicted that premiums are likely to rise 10 percent more per year than they would have if the mandate for insurance coverage had been maintained. While Republican leadership and the President had been focused on repealing the individual coverage mandate for political reasons, another reason to include the repeal of the individual mandate in the tax law was to use it as a pay-for; CBO estimates eliminating the mandate will save the government more than $300 billion over 10 years because fewer people will receive insurance subsidies or coverage through Medicaid. Another element of health care policy in the law impacts individuals with high medical expenses. As a result of this tax law, in 2017 and 2018, people whose medical expenses exceed 7.5 percent of their income will be eligible to deduct those expenses from their income for tax purposes. In 2019 that threshold will return to 10 percent of their income. The new tax law also provides for a permanent flat 21 percent tax rate for corporations. Additionally, some pass-through service business will also get a tax break. Specified service business owners such as physical therapists who pay their business taxes through their individual tax returns may be able to access a 20 percent tax deduction on qualified business income—but only if certain conditions are met. This tax provision may benefit some physical therapists in private practice. PPS members should contact their tax professional for advice. The Department of Health and Human Services (HHS) was active this year; PPS members have seen both wins and losses. The year began under the leadership of Dr. Tom Price, a former member of Congress and orthopedic surgeon who had long opposed bundled payment models and many other regulations put in place by the Obama administration. After repeated delays of implementation, on December 1, 2017, CMS published a final rule to officially cancel the expansion of the Comprehensive Care for Joint Replacement (CJR) model to surgical hip and femur fracture treatment (SHFFT) episodes. Furthermore, this final rule scaled back the CJR model itself to require participation from hospitals in only 34 of the original 67 geographic areas. Hospitals in the remaining 33 geographic areas may continue to participate, but needed to inform CMS by January 31, 2018, in order to remain part of the model. Once a hospital elects to participate, they are locked in for the duration of the program. The fifth and final performance year will end on December 31, 2020. Additional flexibility for episode costs have been granted to those hospitals located in regions designated as major disaster areas and granted authorized waivers by the Secretary of HHS. When CMS proposed regulations that were relevant to PPS priorities, comments were submitted on behalf of the membership that reflect the perspectives, interests, and concerns of private practice physical therapists. This article will highlight PPS’s response to three proposed regulations this year. Despite the recognition that, by statute, physical therapists will not be eligible to participate, and therefore will not be affected by the Merit-Based Incentive Payment System (MIPS) until 2019 at the earliest, PPS submitted comments on the proposed rule regarding the Quality Payment Program, established under the Medicare Access and CHIP Reauthorization Act (MACRA) program. These comments supported the creation of virtual groups and increasing the low-volume threshold to $90,000 in Medicare Part B–allowed charges or 200 Medicare Part B patients—on the condition that this is a per eligible clinician metric and not a group threshold. 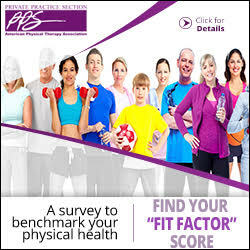 At the same time, the Section’s comments cited examples of how MIPS, as currently structured, runs the risk of creating additional obstacles for physical therapists to participate once they are required to do so. In this year’s Medicare Physician Fee Schedule (MPFS) proposed rule, CMS proposed to maintain the values of some current procedural terminology (CPT) codes commonly used by physical therapists, and even increase values for a few. PPS encouraged members to submit comments thanking CMS for responding to years of work by APTA and other stakeholders to maintain code values. However, with the final rule, CMS unexpectedly reversed its position and instead reduced some practice expense (PE) relative value units (RVUs), effective January 1, 2018. Shortly thereafter, PPS posted resources in the form of an explanation of how practices could be impacted, an overview of the advocacy process, as well as a link to the APTA calculator that members can use to evaluate how the final rule values will impact their reimbursement in 2018. Each year the MPFS is updated; as such, the Section will continue to advocate for payments that reflect the varied complexity that each code represents. Despite repeated attempts, the legislative branch failed to achieve their goal of reducing the existing Essential Health Benefit (EHB) requirements. 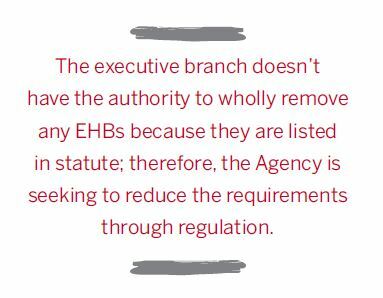 The executive branch doesn’t have the authority to wholly remove any EHBs because they are listed in statute; therefore, the Agency is seeking to scale back the requirements through regulation. CMS proposed a rule to grant states maximum flexibility to define habilitative and rehabilitative care. Erosion of coverage for EHBs could lead to skimpier health plans on the individual and small group insurance markets and higher out-of-pocket costs for consumers. It is important to note that while flexibility is being proposed, states would not be required to alter the current list of EHBs. The rule would impact insurance plans starting in 2019. PPS submitted comments in opposition to CMS’s proposal to alter the current process by which states choose an EHB-benchmark plan. Citing the importance of access to habilitative and rehabilitative care, protecting consumers, and avoiding significant market disruption, PPS strongly recommended that CMS not pursue its proposed changes and also not permit states to select a new EHB-benchmark plan on an annual basis. Since Dr. Tom Price resigned in September amid scandal of wasting up to $1 million taxpayer dollars on trips taken on private jets instead of commercial airlines, CMS has been functioning with an Acting Secretary. In November 2017, Alex Azar was nominated to fill the position of Secretary. Azar is familiar with the Agency; he served as HHS Deputy Secretary and General Counsel under President George W. Bush. He also has deep Indiana connections, having worked closely with both Vice President Mike Pence and CMS Administrator Seema Verma while president of pharmaceutical giant Eli Lilly’s U.S. arm. As of this writing he has yet to be confirmed by the United States Senate. 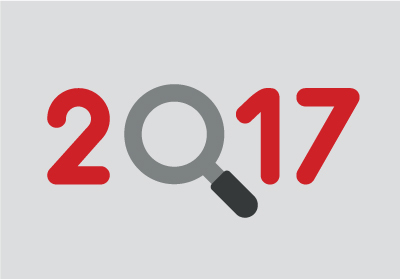 Throughout 2017 your lobbyists focused on removing barriers to access as well as proposals that could improve business opportunities for private practice physical therapists. For the second session of this 115th Congress, we will continue to use the legislative and regulatory advocacy priorities as our guide when working with Congress and the administration on behalf of the Section and its members. We will identify and act on opportunities to advance PPS’s legislative and regulatory agenda. In an election year, Congress generally steers clear of hot-button issues and most legislative activity is focused on bipartisan proposals; however, Speaker of the House Paul Ryan (R-WI) and other congressional leaders have hinted that they are interested in pursuing entitlement reform in 2018. Should they advance this agenda, your lobbyists will stay abreast of proposals to reform Medicare and Medicaid—both of which could impact your practices and your patients. Since the voice of PPS members as constituents, business owners, and providers is a valuable part of our advocacy efforts, we will call upon you as necessary and encourage you to engage with your elected officials. Alpha Lillstrom Cheng, JD, MA, is a registered federal lobbyist and a principal in the firm Lillstrom Cheng Connolly, which has been retained by PPS. An attorney by training, she provides guidance to companies, nonprofit organizations, and political campaigns. For six years, she served as Senior Policy Advisor and Counsel for Health, Judiciary, and Education issues for Senator Jon Tester (Montana), advising and contributing to the development of the Affordable Care Act, as well as working on issues of election law, privacy, government transparency, and accountability. Alpha has also directed Voter Protection efforts for Senators Bob Casey, Al Franken, Russ Feingold, Mark Begich, and Katie McGinty. She was Senator Franken’s Policy Director during his first campaign and was hand-picked to be the Recount Director for his eventual 312-vote win in 2009.